One of my dearest friends turns 30 today, and so, because I can't be there to celebrate with him, I set out this afternoon to make him an e-cake. Really, if I were making a cake for this friend, knowing he would eat it, it would be something slim and elegant, dark with the darkest of chocolate, a touch of alcohol, maybe the faintest taste of orange. But since he's not here, I ended up with this instead: an apple and blueberry shortcake that's really, let's face it, a pie. 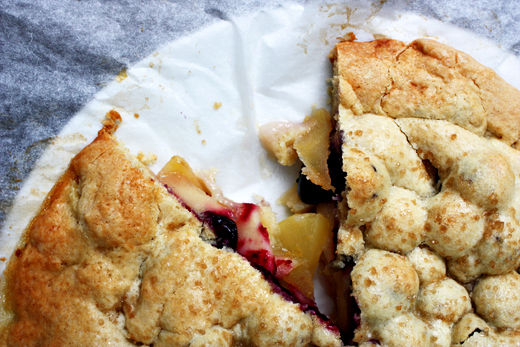 It's Bill Granger's fault that I started out making a cake and ended up with a pie, but it would be ungracious of me to complain, because this cake/pie is so very good. 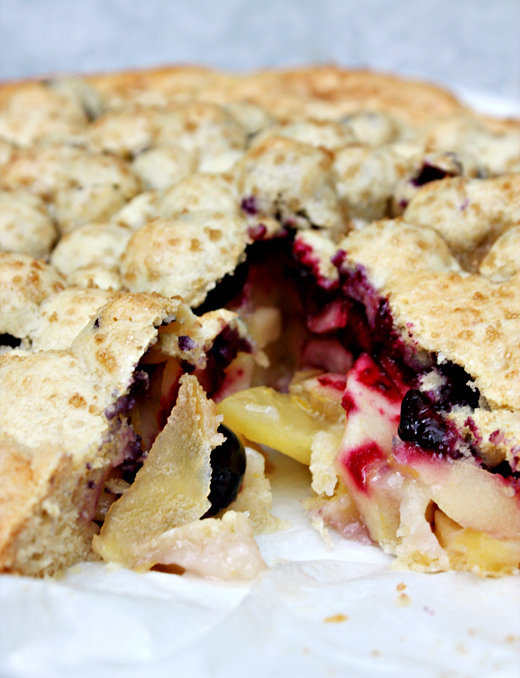 In fact, now that I think further on the issue of the cake/pie, the final effect is something more like an enormous, soft and delicious cookie stuffed with stewed apple and blueberries. I'm certain my friend would approve, and so I offer it to him with love: HAPPY BIRTHDAY!! Peel and core the apples, then cut into about 16 slices. Put the apples, lemon zest, the 2 tablespoons of sugar, and 2 tablespoons of water into a medium saucepan, then cover and stew over a low heat for about 10 minutes, until the apples are soft but not mushy. Allow to cool. Cream the butter and caster sugar together in a bowl until fluffy and smooth. Add the egg and mix well. Sift the flour and baking baking powder into the mixture and stir until combined. Turn onto a lightly floured surface and knead until smooth. Divide into two and refrigerate for 30 minutes. Preheat the oven to 180°C / 350°F / gas 4. Roll each half of cake dough into a circle approximately 22cm (8 1/2 inch) across. Press one circle into a 24cm (9 inch) non-stick springform cake tin. 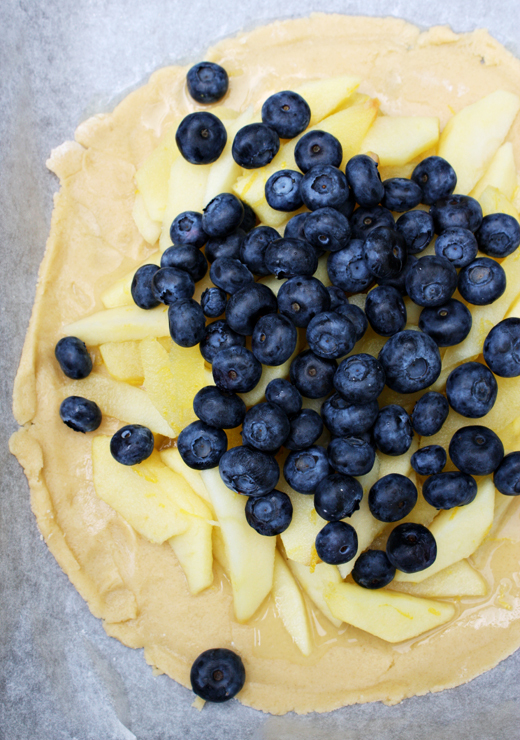 Spread the apples over the dough, leaving a small border around the edge. Sprinkle with blueberries. Place the other round of dough on top and press the edges together. Brush with water and sprinkle with sugar. Bake for 35 to 40 minutes, then allow to cool in the tin for 20 minutes before removing. Serve with cream or vanilla ice cream. Serves 8 to 10. * I actually just remembered that this book was a gift from my birthday friend! That was a lovely accident. This looks fabuloso. If you're anything like me I think it'd also make a naughty next-day breakfast. Do you think it'd work with pears too? Looks wonderful! must try this. Wonderful! I love such kinds of summer treats! Wow, that looks fruity and yummy! Thanks M.B.! Inspired by you, we did eat it for breakfast this morning - delicious. I'm sure it'd be fantastic with pears, and I think I'll try that some day, maybe with blackberries rather than blue. Wow! Booby-blueberry cookie! I'm sure your very lucky, and no doubt flattered, friend would certainly approve! Congrats on being features on The Kitchn/Apartment Therapy. Bills is a fab place to go for breakfast. Incredible! Made this shortbread for mother's day and it won everyone over. The blueberries with the apples are the perfect combination - thanks!! All this lady adulation! How have you all handled this very sticky dough? In two parts at that! If I wanted to make this in advance and freeze it, do you think it would still taste as good?